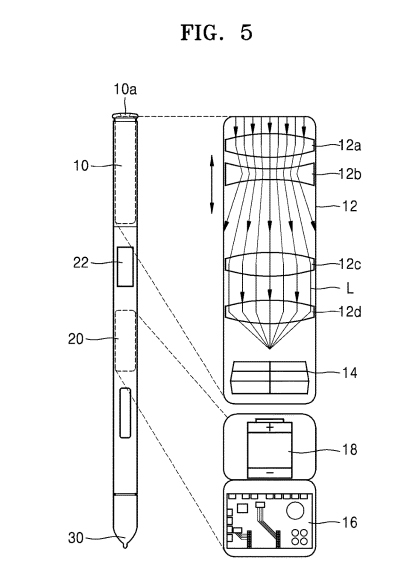 Samsung has had a patent granted for a Galaxy Note S-Pen to feature a camera with an optical zoom system. Schematic diagram showing an electric pen device having an optical zooming feature. The zoom on smartphone cameras, more often than not, lets them down but Samsung is hoping to change this with a patented design that brings an optical system to its Galaxy Note S-Pen. The S-Pen has already seen camera functions introduced to it with the latest version acting as a shutter release for the camera built into the Galaxy Note 9 but turning the S-Pen into a fully functional camera with an optical zoom is a whole new ball game. In the patent, Samsung says: "The electric pen device includes an optical system including a lens and an image sensor configured to convert an image signal of light that has passed through the optical system to an electrical signal. The electric pen device includes a control board configured to interact with an electronic device and a communication module configured to communicate by wire or wirelessly with the electronic device so that an image or a picture taken by a camera is confirmed and an optical zoom is controlled from the external electronic device." A weird choice? Possibly so, but it will be interesting to see how the design will work (if it does materialise).